Judul: YOUR PAYMENT NOTICE ONCE AGAIN. is next on the list of those who were supposed to received their fund. Available at Brookshire's locations, Western Union is a convenient way to send money fast. It's easy, reliable and you have a choice of great options. Use the right money transfer service for you to get money there fast, nationwide and worldwide. I wish to inform you thatwe have released your firstwestern union payments in the sum of $9,500 via direct western union transfer to you. Note that since this remittance is drawn from theING TRUST UKreservedaccount, you would needtosend thesum ofGBP650 ( SIX HUNDRED AND FIFTYGREAT BRITISH POUNDS)only in order toobtain a clearance code that will enable you to pick up the western union transfer from any ofthe western union agent or offices nearest to you. The transfer codewill enable any of our agent to have access to the account from where this transfer is drawn from and be able to release your payment to you. PLEASSE NOTE : Without the transfer code, you would not be able to pick up the money. What you need is the MTCN and the account access code to receive your money. YOU ONLY NEED TO PAY FOR THE CODE ONCE AND IT COVERS ALL OTHER PAYMENTS. Belloware the information of your first payment, the money is available but would not be paid to you because the access code is not yet released to you. We are working under instruction and policy biding this transaction. Open the link web page below and track your payment first to confirm if your payment is there for you to pick up. After you have tracked your payment and confirm it online, confirm back to me in order to advise you as to how and where to send the access code fee that will enable you to go to western union office nearest to you and collect your payment. 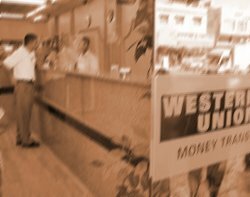 As we focus on making a difference in people's lives, people focus on Western Union and acknowledge the possibilities we offer to those we serve.